I just watched Sleeping Beauty: Diamond Edition which was released on October 7, 2014. The last time I saw this movie was back in 2008 when I reviewed the Sleeping Beauty: 50th Anniversary Platinum Edition which was released on October 7, 2008. So about 6 years ago. It looks and sounds just as good, if not better. The 50th anniversary edition looked fantastic so it's hard to tell if the visuals improved. But it is on blu-ray, so probably. Since I already did a fairly in depth review of the 50th Anniversary Platinum Edition there would be little point to cover the same ground with this release, so instead I'll just cover the extra features. I would cover just the new extras but it's been too long and I don't remember what's new and what's not. There are two deleted scenes, The Curse Fulfilled and The Fair , and an alternate scene The Arrival of Maleficent . The first is a few minutes long and involves Maleficent disguised as an old lady talking to Aurora in order to have her engage the curse. The second is like 7-8 minutes long and is about a Aurora sneaking out of the castle to go to the fair. All are storyboards, so not quite as nice as the actual movie, but are entertaining and provide insight to what could have been. Then there is a featurette called The Art of Evil: Generations of Disney Villains which is all about the creator of Maleficent, Mark Davis. He was an animator who created more than just Maleficent and we get to learn about him, his art, and his influence on others. This was a good extra which I enjoyed. Disneyanimation: Artists in Motion is a short little featurette where a visual development artist makes a three dimensional paper sculpture of Maleficent. Quite impressive! There is a preview video below which shows what I'm talking about. Let's see, there's also featurettes about the making of the film and the restoration process, which I'm pretty sure I've seen before and must have been on the previous release. There is a featurette about Disney World which definitely seems new, though it's not really in depth and unfortunately not very interesting. Then there was some music video which didn't impress... and I think that's about it. If you didn't get the previous release and you're a fan of this film, then this is certainly a well-done release worth getting. I was not that fond of the movie so personally I'd pass it up, but I know this will appeal to many others. 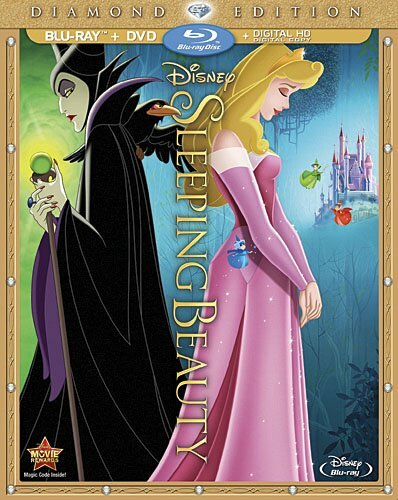 Sleeping Beauty: Diamond Edition , released by Walt Disney Video, is available starting October 7, 2014.